Carroll junior John Brun executes a kill in the second set against Fenwick, March 28 in Riverside. Fenwick won the battle of state-ranked Division II teams in straight sets. Carroll’s Ethan Perkins makes a successful dig on the way to the team setting up Cannon Tucket for a spike, March 28 in a boys high school volleyball match against Greater Catholic League Co-Ed foe Fenwick. 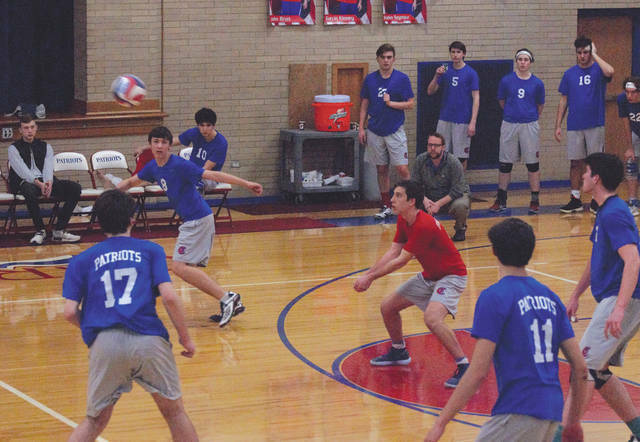 RIVERSIDE — The night for the Carroll Patriots boys high school volleyball team was summed up when junior John Brun balled up his fist and slammed the cushions underneath the backboard in the gym, moments after dropping the second set to their Greater Catholic League opponents, the Fenwick Falcons. The Patriots, ranked No. 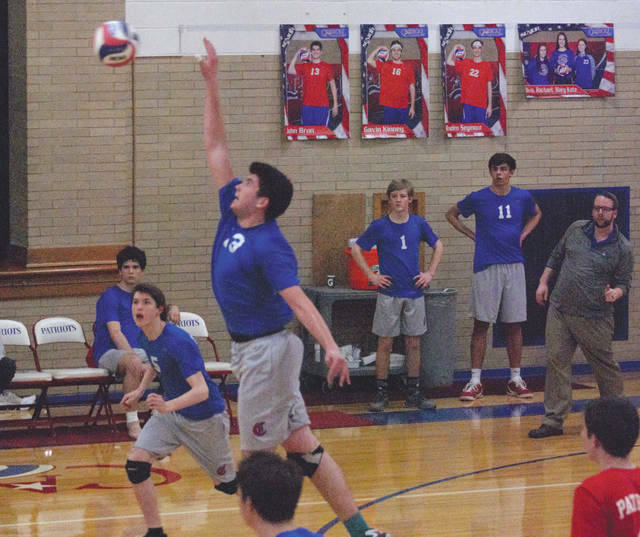 8 in the latest Ohio High School Boys Volleyball Association state Division II poll, struggled through frustrating errors on the way to being swept in their home opener by a score of 25-21, 25-20, 25-17 and falling to 2-1 on the season. Fenwick is currently ranked No. 3 in the same poll, despite a 2-2 overall record. The Patriots lost one of their seniors, Max Polanka, within the first few points of the first set with a high ankle sprain. That may have compounded their mistakes and caused some confusion with new rotations, as younger players got in for some play time. The Patriots would like to use that short-term memory when it comes to moving past this loss and preparing for their next game. The Patriots will next play No. 9-ranked Cincinnati McNicholas at 7 p.m., Tuesday April 2, at home. https://www.fairborndailyherald.com/wp-content/uploads/sites/50/2019/03/web1_JohnBrunSpike_PS.jpgCarroll junior John Brun executes a kill in the second set against Fenwick, March 28 in Riverside. Fenwick won the battle of state-ranked Division II teams in straight sets. https://www.fairborndailyherald.com/wp-content/uploads/sites/50/2019/03/web1_PerkinsDig_PS.jpgCarroll’s Ethan Perkins makes a successful dig on the way to the team setting up Cannon Tucket for a spike, March 28 in a boys high school volleyball match against Greater Catholic League Co-Ed foe Fenwick.